Preferred Habitat: Varied habitats including deciduous woods, swamps and city suburbs. 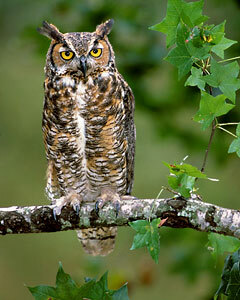 Profile by Glenn Olsen: The majestic Great Horned Owl is the largest owl in Texas measuring almost two feet in length. The two large feather tufts on top of the head give it the appearance of having horns, hence the name. It is a consummate bird of prey that hunts primarily at night. Being a large bird and having powerful talons, it feeds on almost anything as big as or smaller than it is. Dinner may include squirrels, rats, skunks, opossums, rabbits, gophers, and even other birds. It is a great generalist and adapts to almost any habitat and the range includes the entire US, Canada and parts of Alaska. It can be found in city neighborhoods, forested areas, coastal areas, agricultural areas, deserts, and mountains. The birds may nest in a variety of sites including older nests of hawks, in the fork of large tree limbs, and holes and natural cavities in trees. During their courtship phase, the deep bass, low key hoo, hoohoo, hoo, hoo can be heard from a surprising distance as the birds call to each other or to announce their availability. From a distance it may sound a little like a dove's coo but is deeper in tone. Now is a good time to listen and look for this bird in your neighborhood because their breeding season begins as early as December, and young birds may be found in or near the nest during the spring months. Young owls require lots of food, so both parents may hunt during the day, especially early morning and early evening. Because of this you may be more likely to see the owls and possibly even locate the nest of this normally nocturnal and beautiful owl. Young owls are so ugly they are cute.